Maritzburg United coach Steve Komphela feels that his side must learn to value ball possession more highly, following their 1-0 loss to Kaizer Chiefs on Saturday. A tight game at the FNB Stadium was decided by a Mandla Masango penalty just before the half time break. 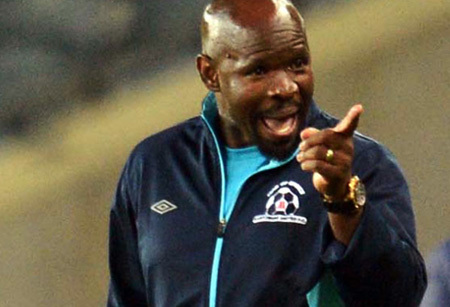 Although the penalty was an arguable one, Komphela accepted that its part of the game, although he admits he was caught off guard at the time, having already been making his way to the change-rooms for a half time talk. "…Accept the penalty, but I don't want to complain because here and there, there were stages where I thought they would have gotten a penalty, but one says give the right ones, don't give the wrong ones. “Coaches get mislead,” he continued. “They move into the dressing room, last three minutes or five before half-time you tend to gather your thoughts, conclude and say what am I going to say. “Then after that it looked like everything had collapsed. Even in the second half, there were instances, where I felt we played into their hands, we had the ball, they waited, we lost it in the crucial areas, they hit on the counter and you don't do that when you play against them. "You make it a point that you secure the ball, you rotate the ball and you retain it properly, upon losing the ball your recovery is key." Team of Choice defender Kwanda Mngomyama was nominated as the man-of-the-match. Mngomyama concedes it was always going to be tough against a Chiefs side that have now win 11 consecutive games since the start of this season. "Unfortunately we couldn't win, they got the set-piece, I don't think they got their goal came in open play, just a set-piece, anyone can win with a set-piece. It was never going to be an easy game, because these guys are moving, they are playing, they are quick, they are playing combinations but they didn't penetrate," he said.